Our volunteers, sponsors, donors and supporters helped us accomplish so much in 2018! 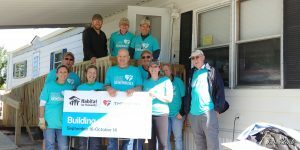 We had great success throughout the year, engaging volunteers during our Women Build Week and Thrivent Building on Faith Month, to complete six wheelchair accessible ramps. Our two signature fundraising events – A Taste for Homes and Golf for Homes – raised over $140,000 in much needed operating support for the organization. 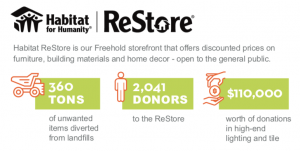 Thanks to more than 2,000 donations received in our ReStore in Freehold, we successfully diverted over 360 tons of reusable items from landfills. And our generous corporate partners donated more than $100,000 of premium building materials to help us raise money to help support our programs. We had great many successes in 2018, but we are even more excited about what will take place in 2019! We are looking forward to our continued partnership with our entire community to continue to build strength, stability, self-reliance and shelter throughout Monmouth County. Together we build hope!